Any unusual plant pest or disease should be reported immediately to the relevant state or territory agriculture agency through the Exotic Plant Pest Hotline (1800 084 881). Early reporting increases the chance of effective control and eradication. Reporting an exotic plant pest should only be done via the Exotic Plant Pest Hotline, or other formal reporting means promoted by state or territory jurisdictions. Careless use of information, particularly if a pest has not been confirmed, can result in extreme stress for individuals and communities, and possibly damaging and unwarranted trade restrictions. 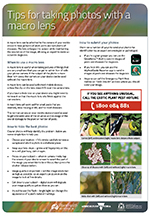 This fact sheet gives some tips on how to take photos of pests or diseases using a macro lens that can be attached to mobile phones and other devices. how widely distributed it is. Every report will be taken seriously, checked out and treated confidentially. In some states and territories, the Exotic Plant Pest Hotline only operates during business hours. The table below outlines the operating hours in each jurisdiction and an alternative contact if necessary. Suspect material should not generally be moved or collected without seeking advice from the relevant state or territory department, as incorrect handling of samples could spread the pest or render the samples unsuitable for diagnostic purposes. State or territory agriculture department officers will usually be responsible for sampling and identification of pests.